With Earth Day quickly approaching, I thought I’d take some time to dig further into my exploration of green living. Our deep dive today looks at the world of roofing, and more specifically, how you can make your roof eco-friendly. So if you’re looking for easy ways to make a positive impact on the environment, your home, and your wallet, you’ve come to the right place! This past winter, our kitchen had an unbelievable draft. It was at least 15 degrees colder than the rest of the house, and my husband and I could not figure out why. After doing some digging, however, I found that there was absolutely NO insulation in the attic above the hall closet. To make matters worse, there was an open vent leading directly outside. No wonder it felt so cold! It turns out that uninsulated roofs lose 25% of your home’s heat. 25% – that’s crazy! It makes me cringe just thinking of all the wasted energy. Luckily, installing loft insulation is super easy. For the time being, I DIY-ed it by putting thermal wool up in the attic space. In a few weeks, however, we’re having a professional come and spray foam insulation. That way, we’ll keep out house much warmer next winter. On the opposite side of the spectrum, if you live in a warm region, you might consider installing cool roofing. These roofs are designed to reflect more sunlight and absorb less heat, which keeps your home cooler on a hot day. My parents practice rainwater harvesting at their house, and I think it’s a brilliant idea. They use rain barrels, which collect water that falls off the roof. They then connect that barrel to a hose, and they use the harvest water for their plants all summer long. If you really want to go “all out,” you could also install a purifying system, which turns this rainwater into drinkable water. So cool! I’ve been eyeing solar panels for a while now; they are becoming increasingly popular, and the benefits are incredible. Basically, solar panels give us the option to generate our own electricity from the sun rather than relying on the electrical company for power. Because it’s becoming more mainstream, solar panel installation is less costly than it used to be, which makes it an even better investment. What’s more, if you plan on selling your property soon, having solar panels could increase the value of your home as well. Double win. Are you looking for more ways to live a greener life? Download my list of 80 tips for green living today! 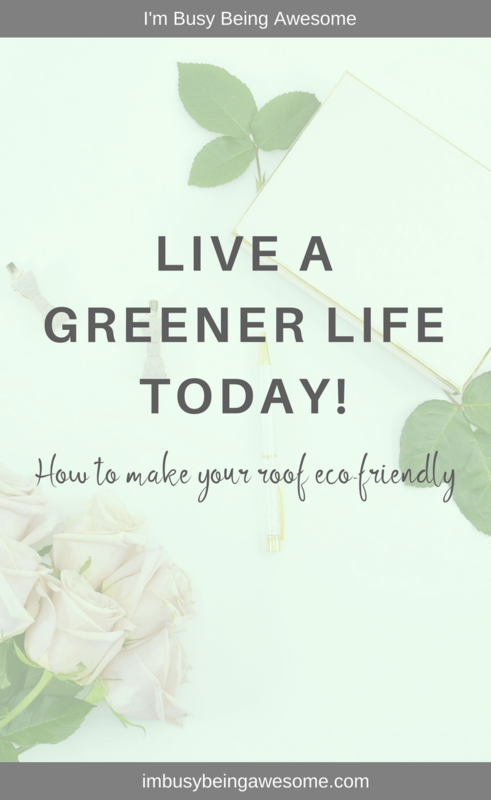 How do you make your roof eco-friendly? Do you have solar panels? Have you ever collected rainwater? What are you favorite tips for living a greener life? Let me know below! Solar panels are popping up all over around here! Thankfully my father-in-law owns a roofing/construction company so we have already implemented a lot of efficient features into our home. We hope to purchase a house within the next year or two and have talked extensively about solar panels and capturing rain water. They are great ways to be eco-friendly. I’ve never heard of cool roofing. That might also be a consideration! Oh that’s great you got solar paneling. My grandparents have solar paneling and love it. Yeah, we haven’t purchased it yet. But I hope to soon! Glad to hear your grandparents love theirs! I love the idea of using rain barrels! I want to do this, I need to get me some barrels quick… the rain is really coming down here! I was thinking the same thing! I live in Boston and we had HUGE amounts of rain yesterday, ha! I had absolutely no information about the roof. I am glad to learn there are eco-friendly options available now. Yeah! So many great options 🙂 Thanks for stopping by!